Having traveled to Korea on several occasions, I feel strongly that experiencing the culture of this vibrant nation firsthand is the way to fully understand the roots of taekwondo. In doing so, practitioners can make a geographical and historical connection with their physical training while sampling the unique heritage of the Korean people. Morning Calm, which is set for July 10-17, 2010. The following are excerpts from my latest book, Taekwondo—a Path to Excellence. On this training and cultural tour we are fortunate beyond measure to be accompanied by martial arts pioneer Grandmaster Richard Chun, president of the United States Taekwondo Association (USTA). Grandmaster Chun had left three days earlier to meet with colleagues from the World Taekwondo Federation (WTF), The Kukkiwon, and Korea Taekwondo Association (KTA) in preparation for our visit. Kyung Won University is located at in the Sujung-gu district of Seoul. Its sprawling campus contains all the modern facilities one would expect of a thriving academic institution. But, unlike its Western counterparts, Kyung Won offers a major in taekwondo. On the top floor of a building situated in the center of the complex is the university’s training hall. As we climb the circular flight of concrete steps leading to the entrance, I realize that over eight thousand miles and nearly two days’ journey separate us from home and this much-anticipated moment in time. After changing into our doboks, we enter a training area measuring roughly fifty by one-hundred feet. Kicking targets, heavy bags, head gear, and chest protectors, or hogu, line the perimeter of the room. Shafts of natural light stream in through the tall windows that peak at the arched ceiling amplifying the contrasting colors of the orange and green puzzle mat. A banner beckoning us to embrace the “Dream of Taekwon” hangs above the entry way. We are called to attention in strict military fashion by Master Jang Ki Park, a professor of taekwondo at the university. Bows of respect are exchanged between the instructors, our group, the Kyung Won students, and members of the Syrian national taekwondo team, there, coincidently, to mutually participate in this advanced training program. As a prelude to our practice, we begin with a set of exercises intended to condition the muscles and heat the body’s core. These consist of jumping jacks, sit-ups, push-ups, and static stretches followed by a series of relays. Mindful of building team spirit, we run, jump, evade, and crawl in six lines of ten students each, from one end of the dojang to the other. Prepared now for an increase in intensity, the kicking drills begin in earnest. Kyung Won students sporting the university’s logo on the back of their doboks stand at the head of each line holding a kicking target. One by one, we execute round, hook, spinning hook, jumping round, turning back, and push kicks in an effort to enhance our technique. Blood-chilling kihops punctuate the strikes delivered by the Korean students. A 3rd dan at the time, I am intimidated by the high level of proficiency exhibited by these outstanding martial artists. The Kyung Won student wielding a kicking paddle at the head of our line notices my apprehension and offers an encouraging smile. I am intent on performing flawlessly my next time up and when I correctly complete the technique, the student nods approvingly. An hour later we begin to practice poomsae. Since the university adheres to the rules and regulations of the WTF, color belts practice the Taegeuk series while the various dan grade black belts perform Koryo, Keumgang, Taebaek, Pyongwon, and Sipjin according to rank. Thoroughly exhausted after three hours of solid training, we break for lunch. Our hosts treat us to bulgogi—marinated beef over rice, complemented by kimchi, the ubiquitous pickled cabbage served with every meal. Following this delicious repast, we attempt to regain our strength by lounging in a shady, open-air pavilion beneath the ginkgo trees that line the campus. At the resumption of our training, Master Park, presumably sensing the effect the hot afternoon is having on his students, begins with a remarkable method of dynamic meditation. Seated in a half-lotus position, we perform a deep breathing exercise conjoined with a series of arm stretches and body bends that instantly ignites our internal Ki energy. Much refreshed, we are now prepared for the rigorous self-defense and sparring drills that lay ahead. With the assistance of Master Sang Bum Yoon, Jang Ki Park demonstrates a number of effective ho sin sool tactics, intended to disarm, disable, or subdue an attacker. I am grateful to see that the traditional aspects of taekwondo, those of a purely defensive nature, are not dismissed by the attending masters in favor of the sportive elements so prevalent in the martial arts today. In preparation for WTF style, full-contact sparring, a training feature favored by many in our group, Master Park’s senior, Professor Kyu Seok Lee with one of his most able students in tow, demonstrates the “twenty-five second drill.” In this exercise student A, who is the holder, rotates a kicking paddle through the four compass points causing student B, the defender, to circulate within each quadrant while executing a combination of kicking techniques. Anyone attempting this drill for the first time, as well as realizing the value of aerobic conditioning, quickly comes to appreciate the dual roles agility and focus play in taekwondo. At this point, those wishing to are directed to don fighting gear. Admittedly, it is one thing to spar with students from your own school and another altogether to go eye to eye with some of the world’s most elite martial artists. Nevertheless, this is precisely why many of our students elected to visit Korea in the first place: to develop courage in the face of danger while cultivating martial arts skill in harmony with others. Still, how would it go? We trained at Kyung Won University for several hours, appreciating the gracious hospitality of our hosts. Three members of our group who are eager to take advantage of a unique opportunity to spar elite fighters suit up in full fighting gear, putting on hogu, helmet, arm guards, and shin/instep protectors. A member of our group is facing a wiry student from the Kyung Won Taekwondo Team, perhaps half his age. Both are called to attention by Master Jang Ki Park, our instructor and a professor of taekwondology at the university. Bows of respect are exchanged. Master Park shouts “kyorugi choombi,” and both men assume the upright fighting stance. Pulling his hand swiftly back in a front stance, Master Park yells: “sijak!” One thing immediately becomes evident: the Korean martial artists are blindingly fast. This is perhaps the first impression you receive when the sparring begins. Multiple jumping, turning, and thrusting strikes are delivered within fractions of a second. The next obvious thing you cannot help but notice is the kihops that punctuate each technique. These spirit yells not only draw and project Ki from the tanjun, our reservoir of internal energy located two inches below the navel, but in a more practical sense, startle the opponent, causing fear and hesitation to blossom in the heart, while short circuiting concentration. This speed coupled with the sonic interruption of focus, is a certain recipe for victory both in self-defense and sport sparring. Meanwhile, another one of our students seems to be doing well. He competes regularly in the United States and is a cool competitor. He counters round kicks with jump-turning back kicks and successfully attacks with his premiere technique, the front leg crescent. Time is called. Both fighters bow and embrace one another, proud to have participated in competition of this intensity and quality. The next two matches are fought with equal vigor and all are pleased with the results. However, it is clear that while no overt mention has been made of it, the Koreans appear to be holding back. In truth, this is understandable, in no small part due to the age disparity within the group and a training regimen that requires them to work out continuously each day resulting in unprecedented endurance. Yet, it is evident that the Korean instructors and students realize we are here to learn from them and not merely to compete. As always, taekwondo, regardless of cultural background, is founded on mutual respect. After a full day of hard taekwondo training, we are ready to enjoy the nightlife of Seoul, Korea’s capital city with a population of nearly eleven million people. Dinner reservations await us at an officer’s club on a local army base. High ranking U.S. and Korean soldiers dressed in crisp uniforms adorned with medals and braids smile and wave when they discover we are American martial artists studying abroad. The festive ambiance is amplified all the more by steins of O.B., a popular Korean beer, that are graciously offered to us by white-jacketed waiters. The restaurant has a decidedly Western flavor and so we choose meat cutlet, a deep-fried breaded steak, from the menu. Following this delightful meal, we travel a short distance to the Namdaemun Market, a vast open-air maze of alleyways populated by street vendors and small shops that sell everything from native celadon vases to dried squid, potent ginseng root to fine Asian silk. Haggling is expected and many in our group walk away with unbelievable bargains. 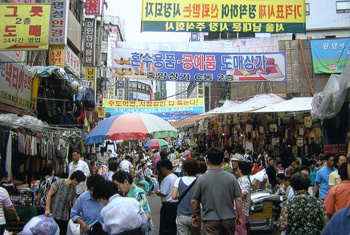 Later, we stroll a section of the It’aewon, a strip of hotels, nightclubs, and outlet stores featuring designer clothing, souvenirs, and porcelain goods. I climb a narrow flight of steps to the door of a cramped tailor shop I recall from my last few visits. There, I purchase a black satin jacket and have “Chosun Taekwondo Academy” embroidered on the back while I wait, all for 23,000 won, or roughly twenty dollars. By this time I am eager to return to my traditional ondol hotel room where I stretch out on my sleeping mat for a much-needed night’s rest. Tomorrow will be a motor coach trip to Kyongiu, the ancient capital of the Sillia Kingdom and the training ground of the Hwarang, Korea’s ancient warrior-elite that devoted much time to the practice of the martial arts underscored by an appreciation for Asian philosophy and ethical behavior in battle.